William E. "Bill" Thomas was born on December 26, 1916 in Pittsburgh, Pennsylvania, and graduated from Westinghouse High School. He received several athletic scholarship offers from local colleges but, instead, went to work as a steamfitter and earned a reputation as a semi-pro baseball and football player in the Pittsburgh area. Thomas entered military service on March 13, 1942. Following training in Mississippi and Colorado, he was stationed with the groundcrew at Victorville Army Air Base in California, with the 523rd Bombardier Training Squadron. In November 1942, he married June Green. The Victorville Bombers baseball team got off to a good start in 1943, winning their first four games. On Sunday, May 23, 1943, the team was scheduled to play a game in Las Vegas. Some of the players would fly there and the flight was to end in tragedy. The official story released by the military claimed the Beechcraft AT-11 Kansan, in which Thomas was travelling (and only because he had switched places to ride with his friend, John Lowry), was struck by another AT-11 while on a bombardier training exercise. Thomas’s plane crashed at Silver Lake, California, about 90 miles from Victorville, while the other plane, which suffered minimal damage, managed to land safely back at the airfield. In truth, the two planes were heading to Las Vegas for a baseball game; on board the AT-11 with Thomas were Second Lieutenant Hal Dobson, a former minor league pitcher from Lincoln, Nebraska, and Sgt. John A. Lowry, a former semi-pro player also from the Pittsburgh area. The pilots of the two planes were playing games with each other and one plane cut the tail off Thomas’s plane. All on board the crippled AT-11 – Thomas, Dobson, Lowry and the pilot, 2/Lt. William S. Barnes, were killed. 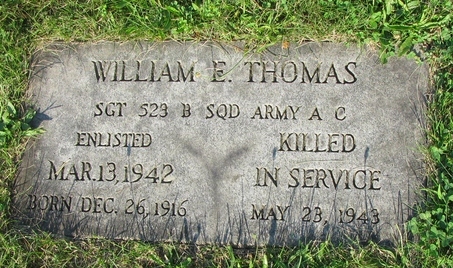 Bill Thomas is buried at St. Peter’s Cemetery in Pittsburgh, Pennsylvania.